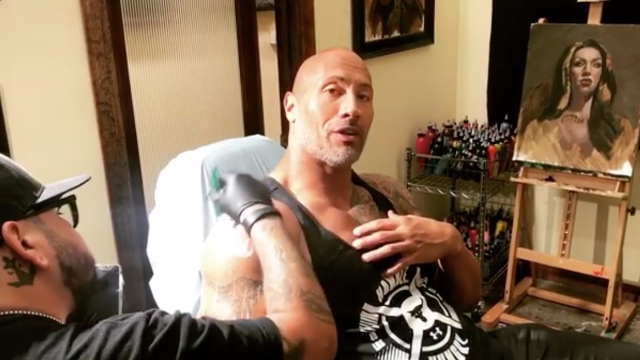 'The Rock' just gave his tattoo a really big makeover. Like, REALLY BIG. The relatively small bull that once occupied Johnson's bicep has transformed into a giant tattoo that spreads from his elbow to his shoulder. Johnson shared a before-and-after photo of the "evolution of the bull" to his Instagram page on Friday. "After 3 sessions and 22hrs of tattooing with world renowned @NikkoHurtado, the story's almost done," Johnson captioned the photo. "Every detail is a reflection of my own personal history." Earlier this week, Johnson posted a video to Instagram of the bull undergoing its transformation. "I've engrained this bull in my DNA for two decades. My core. Humbly, it's also become a symbol of strength, resilience, heart, power, and defiance to so many people around the world," Johnson captioned the video. "I got this tattoo when I was just a kid. Now I need it to reflect me as a man." "All my ink is a rite of passage and spiritual and the MANA (power and spirit) has to be right before we begin," he continued. "Mana is strong with world renowned Nikko. We talked for hours about the man I am today, compared to who I once was. And who I"ll always be. We all desire to grow and evolve. The mana is right... let the blood and pain begin. #EvolutionOfTheBull #WheresMyVicodin"
Okay, now we're really convinced The Rock is secretly Maui IRL.